We'll be back in 2009. Enjoy the holidays and remember, no double dipping! We received a frantic phone call recently from a good friend in Chicago. "Call me, someone I know is going to an engagement party and she's not sure if she should take a present." The answer was brief and simple, "No." An engagement party isn't about gifts. It's about an announcement of a couple's commitment to close friends and family. Usually if you make the engagement party cut, you'll be invited to the wedding and probably a bridal shower. You'll have ample opportunity to spend money, don't forget the outfit you'll wear to the wedding and travel expenses if it's going to be a destination wedding. Some people feel compelled to take presents even if there is a request for no presents on the invitation. This could pose discomfort to those who adhered to the request. There is nothing worse than sharing an elevator with people going to the same party with some holding presents and others not. If you're holding a present, be discreet when you give it. No need to announce, "This is for youuuu." Then the poor receiver has to say, "Oh, you didn't have to do this." This gets dull quickly. Some people just can't help themselves. They just have to give presents. That's fine but not at the party. You can send a gift or give one in person on another occasion like dinner or over a drink - you should probably pick up the tab too. We've talked about gifting before. It seems to become a problem when the giver thinks it's all about them and has little to do with the person who will be receiving the present. Some use it has an opportunity to posture in front of others. "I'll show them who has manners!" Well show them. If you're asked not to bring a present don't. IT IS THE PROPER THING TO DO! Several posts ago, we talked about children walking on seating in public spaces. Parents don't seem to mind. It's as if they believe that the soles of their children's shoes have some sort of self-cleaning process. Yvette participated in a flea market at her apartment complex. She noticed a little girl with her blanket on the ground covered with a collection of children's books - all for sale. There was a fee for each tenant's table of twenty dollars. You had to have a table. We think that the parents of this young entrepreneur should've cleared their daughter's venture with the organizer. Did the child get a free pass because she was a child? Of course. If an adult had spread out a blanket and displayed books for sale, would the organizer have said something? Of course. When it comes to rules, there shouldn't be a double standard. When kids sneeze, cough or pick their noses, they should do what an adult would do, cover up or use a tissue. Remember, the stuff coming out of their mouths and noses is no more hygienic than what comes out of an adult's nose or mouth. And while we're talking about gross stuff, teaching children to wash their hands after using the bathroom is important. It's a fact that kids spread germs. They also grow up. There is nothing more unsettling to see an adult skipping hand washing. A restaurant can be a great learning experience for children. It can also be a learning experience for those dining with children who don't belong to them. Say a kid of ten is tagging along for dinner and he orders a surf and turf special (no crumb snatcher here), usually a pricey entree. What happens when the check comes? Should it be evenly divided or should the parents of the child offer to pay for his meal? We think it shouldn't even be a discussion. The parents should offer to pay. If the other diners insist that the check should be divided evenly, that's another story and that's fine. These days, it's hard to know who's the boss when it comes to children. They rule. One friend asked an adult visiting to leave because her little boy didn't feel like company. Another was offered a ride by a family. At the last minute, she had to re-arrange her trip because one of the children decided she wanted to stay home. True, she was tired but what does that teach her about commitment? Was that explained? Growing up our parents had a mantra, "You are a reflection of us." "Miss, you look good for your age." We get this a lot. And it never feels good and certainly doesn't sound like a compliment. And since we have manners, we never return the compliment. Earlier this week The New York Times published an article on the subject of seniors and the silly things people say to them. They call them, "sweetie" or ask them, "How many years young are you?" The list goes on and on. We would like to add, "You look good for your age." When you see a well put together, attractive older person, there's no need to point out to them that you think they look good for being that old. An age, any age doesn't have one look or play by one rule. We all carry our ages differently. Some young people don't look so hot and some do. We understand that there are people well into their 70's, 80's even 90's who still may have beautiful skin or are in great physical shape. If you feel the need to compliment them, go for it but don't insult them and point out that they're not supposed to look so good. "You look good for your age," is exactly that. And whatever you do, don't drag your parents or grandparents into it. One woman said to Yvette, "I wish my mother would take some fashion tips from you." Compliments are nice at any age. And there is an art to giving them and accepting them. Like anything, think before you give one. Is it a compliment that you would like to receive? Or is it a compliment that you wouldn't mind if you were the receiver? Be careful. If you think that aging means becoming dowdy and tired, then you're more apt to give an unsavory compliment. If you think that at any age a person can put themselves together well, then you'll probably have a winning way with compliments. Receiving a compliment graciously that may not make you feel so great is not always easy. If you know the person, there's nothing wrong with saying, "I know you meant that as a compliment and thank you but age has nothing to do with it." They'll get the point. The next time you pay a compliment, don't show your age, show your style. We think this one gets first prize for the tackiest, dumbest, stupidest question. It's also mean spirited because someone who has a love life (or thinks they have one or is about to lose one) is usually the one posing the question. If you have to ask someone this question, this means that you're totally out of line because you aren't even a good friend. Or perhaps you have to ask because unbeknownst to you, you are no longer considered worthy to be privy to this information. If someone has a love life, they will tell you. It's just that simple. The question has no value. What's the answer? Is it a perky, "I don't have a love life."? Since we're twins, people think everything about us should be in sync. "Does your sister have a boyfriend, too?" We love opportunities to change the subject, it makes for a more interesting conversation. Smug couples like asking their single friends about their love lives. It's as if they have some divine right to pry. If this happens to you, just know you've hit pay dirt. Smile sweetly, don't answer the question. Instead, ask, "How's yours?" Note the lips curling, the eyes no longer dancing and the disappearing smiles. When Yvonne lived in Italy, where it seems like the whole country is married, people always wanted to know about her personal life. I remember her telling me that every time she'd come back from a great vacation, the first question from married friends was, "Did you meet anybody?" It was if the whole point of going on vacation was to meet someone. That she had a great time and saw something new and interesting didn't matter. The entire vacation was cancelled or a flop because she didn't meet SOMEONE. Tired of this tired question, she shut one friend up for good. The woman, married to a wealthy man, had come back from a fabulous vacation with her husband. "How was it?" she asked. Yvonne had just come back from Tangier. "Did you meet anyone?" "No," Yvonne responded, "Did you?" The woman never asked Yvonne that question again. And no one else should ever ask it either. THEIR WINE OR YOUR WINE? What to do when a guest brings a bottle of wine? Do you open it? Or do you serve them what you have? It depends and this can get tricky. Say if you serving a white wine that didn't cost that much and is also awful. Your guest gives you a bottle of Pouilly-Fuisse and it's not gift wrapped. Do you say, "This is nice, let's have this." Or do you say, "Thanks, I can't wait to try this. Can I get you a glass of wine?" If it's that cheap wine you've been drinking, you're not being very gracious. When you know that your wine isn't as good as the wine someone has brought to your house, offer to open it. Let your guest tell you that's not necessary. If it isn't chilled, you can offer the wine that's already opened while the bottle chills. If a guest brings you a really dreadful wine (probably a bottle someone brought to them) you still should mind your manners. Tell them you'd be glad to open theirs, but you have a wonderful white Bordeaux or great red they may like. We bet they'll be happy to drink your wine as opposed to theirs. Champagne is another story. It can get expensive. Maybe the bottle that someone brought is a rare treat for you and you don't want to waste it on people who really aren't champagne drinkers. If it's in the box, keep it in the box. Or if you're in a small group and you know everyone's taste level, open it. But what if you're serving a sparkling wine and someone brings a beautiful champagne? This happened to me, Yvonne, last New Year's Day. I was serving Prosecco. A couple came with a bottle of Veuve Cliquot in a gift box. I was ready to open it. "No, don't. You don't have to, it's not even chilled." I thanked them profusely and continued to serve Prosecco. Had they brought it in chilled and not in the box, I would've insisted on opening it. Then there's the serial bottle opener host. He or she has amassed a clumsy selection of wine from previous guests. They will go through their 'cellar' thinking nothing of serving something Italian, something French, something Italian and nothing for the ensuing headache. If you care about your well-being, this is the night to cut down on your drinking. You don't have to take the wine tour of the world, unless there's some place for you to spit it out. A gift of wine is like any other gift. Most likely, you're in the company of friends and you should know what they like. If you can't afford a nice bottle of wine, don't go to the plonk section of the wine shop unless it's for yourself. And if you're the host, don't go to the plonk section of the wine shop unless it's for yourself. PLEASE, WON'T YOU GIVE OUR BABY A PRESENT? Maybe gifting is on our minds because the holiday season will be here soon enough. Recently I, Yvonne, was at a friend's house and was shown a birth announcement. There was an adorable picture of the baby. Little silver baby shoes were tied together with blue ribbon at the top of the announcement. At the bottom, all things cute flew out the window. In not so tiny type there were two website addresses for baby presents! How no-no can you get? There is no need to solicit presents on an invite or announcement of any kind. Family and good friends will call and offer congratulations and most likely ask if there's anything you need or would like. In the case of babies, you can never have too many of anything, so chances of receiving something silly are slim. Even if these announcements are going to distant relatives and acquaintances, it is not the place of the newborn parents to assume that everyone is going to be sending a gift. Is the announcement about the baby or is about a gift for the baby? Once, Yvette and I were invited to a birthday party. They didn't ask for a present, the invite specified, "cash only." Where's the joy in giving or receiving? Sending your invitees to the cash machine isn't very gracious. Feel free to tell others what you really need or would like if they ask. Never volunteer this kind of information unless it's someone in your immediate family. When you receive a gift, a thank you note is in order as soon as possible. It's especially important to acknowledge gifts if they were ordered from the internet or sent to you from a store. There's nothing more awkward than calling to see if a gift you have sent has been received. No one wants to seem to be begging for thanks. And no one should seem to be begging for a present. And try to avoid writing the thank you in the voice of the baby. They can't talk! I was the first twin to decided to keep her hair gray. Coloring and straightening was taking an unattractive toll on my hair and me. I was always touching it up, sometimes with mascara that ended up as a smudge on a friend's chin one day. I remember the first time I became my sister's mother. We were waiting for a table in a restaurant and the young hostess said, pointing from one twin to the other, "Mother and daughter?" I told her and not so kindly that we were sisters. Recently, I was uptown in a popular restaurant with my boyfriend and a good friend of his. A young man looking at my friend, a very attractive woman, and me gave us a mother and daughter compliment. I tried to be as gracious as possible and responded, "No, were just friends." Last mother's day I jokingly emailed my 'daughter' and chided her for not wishing me a Happy Mother's Day. Yvette and I don't understand why people have the need to identify people they don't know. Why do they find it necessary, based on appearances to try and figure out people's relationships? How many older men are asked if their wives are their daughters? Plenty, I believe - and the same goes for older women with younger men. If one listens and is earnestly engaged in conversation, this information will present itself and save everyone the embarrassment and yes, sometimes the offensiveness that is a result of not listening. Instead, many take the shortcut and blurt out a question. I learned this lesson the hard way. I had arrived at a party with my sister. There was a line at the door, guests preceding us congratulated the host as they entered the apartment. When it was my turn, I congratulated him as well. Yvette and I were guests of a guest, we'd assumed it just an old fashioned house party. A while later I met the lady of the house and someone was congratulating her too. About an hour into the party I walked over to her noticing her pregnant looking stomach. "Congratulations, when are you due?" The minute the question came out of my mouth I knew what was coming. "Do I look pregnant?" I had no choice but to be honest. "You, do and everyone has been congratulating you and your husband, I was sure you were pregnant. I am so sorry. I didn't mean to be rude." She was kind and didn't ask me to leave. Yvette was mortified, she'd seen the whole thing. I learned my lesson. People will tell you who they are. Don't tell them. Don't ask two men if they're brothers, the same goes for two women. Don't ask a man about his wife just because he's wearing a wedding ring. Consider that he may have a husband. A woman may have a wife. children may have two daddies or two mommies. We're losing the art of conversation in our rush to know it all. Better to make snap judgements and conclusions and worry about the facts later. 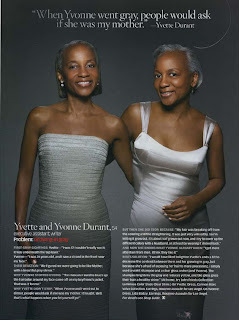 I decided long ago that my gray hair isn't going anywhere and so has Yvette. The picture of that appeared in Oprah last October helped a lot of women make the decision. Some decided not when we told them about the drawbacks. If you're not ready to become your sister's mother and can't contain yourself in a civil manner when this assumption is made and comes flying in your face. Hold off on the gray. We had to discuss it sooner or later, so here we go. Passing gas or flatulence is a natural process. It is not a crime. First, a little background - everyone has gas. Men seem to have more but not really, they just get away with it via jokes and the noisy guy factor. For some vague, healthy reason, a good friend of ours was taking the supplement Brewer's Yeast. It gave him a lot of gas and not the quiet, odorless kind. One day he was on packed elevator in a department store and everyone's worst nightmare happened to him. "I couldn't act like it wasn't me so I turned around and explained that I was taking a supplement and it gives me gas." He said no one responded because their faces were all scrunched up. Some think that they can run away from their gas. But like the saying goes, "Wherever you go, there you are." Others try and blame it on someone else by looking in the direction of an oblivious, innocent bystander. We think you should own your gas. No one else made it but you. The ideal situation is if you're alone or in a bathroom. But life isn't always so convenient. If you're with close friends, say, "You know this only happens when I'm really relaxed. I'm so happy to be here and have you as friends." It gets tricky if you're on a date. You can either disappear forever or just say, "Excuse me, did you hear something?" If you're with someone who is well-mannered, they will feign ignorance. What do we really think you should do? Gas isn't always unpredictable. If you feel discomfort, remove yourself from the area. Try and change your diet, learn which foods are gas producing. Uncooked broccoli before a party could bring new meaning to 'life of the party'. Don't lose your manners because you're mortified. Keep your head up high and just say, "Excuse me." If anyone makes fun of you, excuse them from the room because they have no manners and for that - they stink. Memo to all handbag carriers: Keep your bags to yourself, preferably in front of yourself, not behind as if it doesn't exist because it does, usually in someone else's back or stomach. Many women don't seem to handle their handbags well. They think nothing of letting their bag trail them as they make their way through a crowded bus, train, store and worse - a cocktail party! It's as if they don't acknowledge that there is life behind them. The bigger the bag the more pronounced the detachment between owner and object. You wanted that bag, now carry it properly. When you're in a crowd, keep your purse in front of you and if it's large, keep it low. Not only is this courteous but it's more secure if you want to keep an eye on the contents. You can't have your wine, cheese and oversized bag too. If you know that you're going to a cocktail party at the end of the day, consider carrying a handbag that'll allow you to gracefully have a drink and an hors doeurve. Do not enter a party and act like you're not carrying baggage. Thank goodness the mania for pricey backpacks seems to have subsided. The faux hiker's seemed to have an attitude that said, "It's all right if this is in your way, I paid a lot of money for it." Oh, an about that evening purse on the table, tacky, tacky. We know it's a tricky situation because if you're like us, you don't believe in putting your purse on the floor because it's bad luck - you'll never have money. Actually, that is true, especially when thieves use umbrellas in restaurants to remove your bag that you've placed on the floor. You can place your beaded bag behind you in the chair. It shouldn't be uncomfortable if you're sitting straight. Remember, the next time you choose your handbag for the day, don't bag etiquette. Yvette was having dinner with a friend recently and he kept eating her bread. She's not a big bread eater but would have liked the option to tear off a piece (more on how to eat bread later). Apparently, he didn't know that Yvette's bread plate wasn't his bread plate. I asked her if she pointed this out to him and she said,"No, you should never point something like that out. It could be embarassing, so I acted like nothing." She's right. Bread plates are to the the left, not to the right. One way you can remember this is by asking yourself, "Any bread left?" Once you've figured that out, you're on your way to the bread experience - step one, at least. What will you do if there's a basket of bread and no bread plate? Select the roll or slice of bread you want without touching or searching the basket as if you're looking for treasure. Take the whole slice or roll out of the basket. Tear off a piece, butter it and eat it. The piece should be bite size. The remainder of the roll or piece of bread can be placed on the table next to your plate or if that makes you feel barbaric, put it on the edge of your plate. Try not to slather the whole piece of bread all at once with butter as if you're on a sandwich production line. Relax, you're dining, the bread won't run away from you. Since we're on the subject, I might as well add this - try not to get upset when the bread basket isn't stuffed with warm bread. It shouldn't be cold but room temperature is fine. Don't write off a restaurant just because the bread isn't warm. Funny, we expect things from restaurants that we don't do at home. Do you warm your bread at your house at dinnertime? If a restaurant serves warm bread, that means they have a bread warmer (they just don't throw into the oven). If it they don't serve warm bread, they didn't invest in a warmer. Do say something If the butter arrives in frozen pats. Frozen butter gives new meaning to breaking bread. Enjoy the rest of the meal! A teenage boy was going for a seat near the back of a bus when his father stopped him, pointed to a woman in the front of the bus and said, "There's a lady standing. Never sit if a lady is standing." I was impressed and encouraged that there are still gentlemen who are raising gentlemen. They don't make them like they used to, a well mannered man is a rare breed these days. Maybe it's backlash or a misunderstanding of the feminist movement. Maybe they don't want to offend today's woman, including today's elderly woman and today's pregnant woman. Whatever the reason, they're doing a wonderful job of showing off their rudeness at its best. Our parents always told Yvette and me, "What you do reflects on us." These days men will race a woman to a seat, they will sit in sections reserved for the elderly or sit down and act like nothing even when a woman is standing in front of them. That's not saying much for their parents. Boys take their cues from the people around them. Are we to assume that the man who doesn't offer a woman or elderly man a seat never saw anyone around him do the right thing? Poor manners are like viruses and we're in the throes of an epidemic. Just because women want equality doesn't mean we don't want a seat. Our feet get tired after trying to climb ladders day in and day out. James Baldwin once said that when you open your mouth in England, you're telling who your mother is, who your father is, you're telling your whole history just by the way you speak. We say when a man can't show a woman a simple courtesy, he's talking about his parents. And we don't buy into the fact that many boys are being raised by women. Everything can't be our fault. But we have to do the right thing too. When a man offers a his seat we should accept it graciously. Don't say as I heard one lady say, "Thank you. Do I look that old?" She looked at me and said, "I guess I look old." I couldn't help myself, I turned to her and whispered, "Why don't you just say thank you?" We have to allow men to show us their gentlemanly ways, it'll take a lot of wear and tear off our Manolos. It's summertime and the living is fun and easy - parties, barbecues, etc.. When you tell your hosts that you're planning on attending and you ask her/him what shall you bring, what will you do? Take a bottle of what you drink? A gift of something other than alcohol or nothing? If the host responds by saying, "Bring what you drink." Listen. They are looking out for you especially since you've asked. Taking a bottle of wine when you know very well you prefer vodka is downright rude. Sure there are wines that could cost as much as a bottle of vodka or even more but are you being fair to your host? Many of us were raised to never walk into someone's home empty handed. But that doesn't mean you put any old thing in your hand. If you drink wine, you should take wine. One reason is if your host is not an oenophile you can get stuck drinking a glass of warm white wine that some brought years ago to the party. Maybe your host and most of their friends prefer hard liquor and wine's not their thing. On the other hand, if you like your vodka, you should take vodka, not a bottle of wine that you have no interest in drinking. And when the vodka runs out, don't start in on the gin - not only is it rude but you may have a problem. What you decide to take also depends on the party economics. If you're being hosted by wealthy people, walking in with a bottle maybe tacky. If it's special send it ahead of time or after the party with a note. If your hosts entertain more casually and you know what they like, a bottle what they like is fine. In this case you're can bring a bottle of wine and drink vodka or vice versa. Since they did not ask you to bring what you drink, they already know what you like and here's your opportunity to reciprocate - nicely. Yvette and I wish you lots of fun. Drink responsibly. Cheers! We will be taking a few days off. While we're away, some of your favorite posts in the archives will mysteriously post themselves. In Italy, it's considered good luck to touch a pregnant woman's belly. That is in Italy. In America, we don't like people in our personal space. We don't like feeling someone's flesh pressing against us in a tight space. We don't like people touching us unnecessarily, as many men think they have a right to do to women. We don't like people touching our babies' faces, especially strangers. The other day, Yvette was livid when a friend kept admiring her hair by repeatedly touching it. When Yvette wore braids, people thought it was their right to put their hands all over them. It drove her crazy. Total strangers touching and sometimes pulling her hair! I wear my hair back and sometimes a hair or two (I have three.) will be out of place and my nice friends will sometimes fix it for me. I HATE THAT. Maybe I like that mussed look or maybe I'm aware of what my hair does during the course of the day and I'm okay with that. If I have a hair sticking straight up like Alfalfa, then it's fine to gesture with your hand or a finger that I'm having a style issue and I'll fix it. Would you wipe butter off someone's face? A lot of women wear extensions. You don't want to touch someone's hair and have it end up in your hand. There is no happy ending to this kind of situation. Touching a person's hat should also be avoided. "This woman kept taking my hat off my head," a friend said. "She did it three times and finally I told her she needed to stop." The woman explained that she kept taking his hat off because she liked it. Say what? After Yvette told me about her hairy situation, I explained, "In Italy, people think nothing of touching a pregnant woman's stomach and women are okay with that." "That's in Italy," she replied. CNN's Black in America series is running this week. One topic they've covered is profiling. It's happened to both of us. It is painful, insulting, embarrassing and cruel. It can make you so angry that you just want to lash out - and this can be ugly. We'd like to share a couple of our own personal incidents and how we handled them. While there is good reason to be angry, it doesn’t help to cause a scene, especially when you haven’t done anything. Take a deep breath, ask to see a manager, take names and numbers. Last February a woman moved her purse after checking on it numerous times, there was no way I could’ve taken it. When she finally moved the purse, I went over to her and acknowledged her action. I was calm; I spoke in a hushed tone and politely asked her not to judge all us by the worst of us. (By this time she had rolled her Burberry coat in a ball and stuffed it in a small tote, so I guess she thought I wanted the coat too). Situations like these call for poise, manners and confidence - everything they apparently don't have. I had dinner with friends last night in an Upper East Side restaurant. Our table wasn't ready so we found some seats at the bar. To my right there was a young, white woman. Her bag was hanging on the chair. As I was getting situated, she looked at me and then reached into her bag as if she were looking for something. Her hand came up empty. I turned my chair toward my friends, when I swung my chair around to go to our table, her bag was on the other side of the chair. I had to have a quick little conversation with myself. Would she have done that if I were white? Maybe, but why hadn't she put her bag in a more secure place before I sat down? I wasn't the first customer of the evening and it was clear that she'd been there awhile. That's what racism does - it makes you weigh the situation, when you're black. It can't be coincidence that for all the times I've sat next to a white woman she just happened to move her bag closer or to the other side of her. One woman was kind enough to look at me and say, "Let me give you some space." I'm small, her Chanel purse is small - what space was she talking about? Sometimes I have been tempted to say, "Would you like me to take that for you?" Instead, I opt to say nothing. I just hope that one day she'll have the pleasure of meeting Yvette. Eating in public is an unfortunate act. It's okay if you're at a block party or street fair. You can eat all the fried, doughy stuff you want. Some people think eating meals while walking down the street or sitting on a bus or a train is acceptable behavior. If you've ever sat next to someone having corn chips on public transportation, you know better. Fried fish on the run could make you run too. Recently, we saw a teenager happily eating fries out of a greasy bag and when she was finished, she licked her fingers with gusto. This after touching the poles in the subway car and who knows what else in the subway station. Want some germs with those fries? Walking down the street eating food, even an innocent ice cream cone, is dangerous. It's a fact that we are vulnerable when we eat and walk at the same time. It's to the mugger's advantage that you chow down in public. As for ice cream, it's great street food but walk with someone while you licking it. It's safer and it won't look so sad. So what's a hungry man or woman to do? If you're very hungry and can't wait until you get to where you're going, stay in the pizza parlor or find a corner in the sandwich shop. You can look for a nearby park. Never eat on a bus or train unless you're under five years old or if you're having a medical episode. If someone sitting next to you is eating corn chips and you want to say something, you must be very careful that the person isn't crazy. Better that you find another seat. Maybe you can throw them a look as you dramatically get up and quickly remove yourself from the area. Food is coming at us these days from all different directions. That doesn't mean that it should be eaten in all directions. Yvette and I had something very hurtful happen to us recently. One of our first cousins is getting married and we're not invited to the wedding. BUT OUR BROTHER IS! Ouch! We have taken this situation apart and put it back together again several times. We wondered if something happened that we don't know about. We came up with nothing. Could it be the expense of the wedding and only a few family members were invited? I can understand that. When I got married four years ago, we had a limit of one hundred guests. I had my own criteria for invitees. If I hadn't had dinner with you in the past three years, you weren't invited. 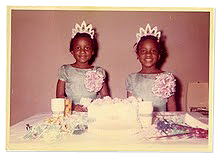 Or if you still can't tell who's Yvonne and who's Yvette, guess who wasn't coming to the wedding? This worked for friends but when it came to family I was very careful. There was one situation, a family of second and third cousins, wherein I couldn't invite all four. We hadn't been in touch for several years but I still wanted representation of their family at my wedding. I picked up the phone and called my cousin and said that I could only invite two out of the four and they're welcome to use it any way they wish. My cousin came to the wedding with his daughter. His wife and son could've come because three people didn't show up and didn't bother to call - that's another story. Yvette and I feel we deserve a phone call from our cousin. We happen to be very fond of him, we love him and he's always been good to us - I would say likewise but from his actions, maybe we haven't been so good to him. We are trying to get into his head. Doesn't he understand that you don't invite one of three siblings? Did I mention that our brother lives in California and we see him once a year? They just skipped over the twins in New York and reached all the way across the country to invite our brother and his wife. I had a good talk with my brother and he was not aware of the invitations that got stuck in the mail or eaten by a bear. He said that a couple of invites were supposed to be 'taken care of'. He said that our cousin's brother is throwing a party for the family the day after the wedding and we're invited. Of course, we will be there. We will not ask about the wedding because there's no benefit in embarrassing people. We will probably not take a present because seeing people, especially family members, squirm isn't how we have a good time. We will be gracious and if and when someone offers an explanation or an apology, we will not encourage long discussions or excuses. We'll offer our congratulations and talk about what a beautiful day it is. And it will be a beautiful day because we'll be spending time with our one and only brother. We see him just once a year. Spitting is awful. There's no ladylike or gentlemanly way to spit. The last time we did it was when we were babies and it was reported that one or both of the twins, "spit up today." Why can't people wait until they get home or to a restroom and spit up in private? No one should be subjected to the possibility of contracting tuberculosis or who knows what else because someone couldn't hold their spit. When you think about it, you can begin to understand why there are shoeless households ( see July 1, 2008). Our poor soles. There is one spitter who stands out from the rest and is more despicable than his/her fellow expectorators - the visitor from another country. It is heartbreaking to see someone who came here to enjoy our Land of Opportunity only to spit on it like nothing. When you see this we don't recommend that you say anything because you could end up being the next target. Yvonne will try and catch the person's eye and with all her might look down at the disgusting glob and then quickly look up again at its owner's eyes with great sorrow. She is convinced that her subtle protest makes people think before they spit the next time. I don't know about that. I'll sometimes throw them a dirty look. I don't say anything because they've already spat and some of them look kind of crazy. Many men spit because they think they have the hormonal right to show off their aim. Excuse us for being a little disgusting but beware of the the man who has just spit and wants to kiss you. You see where we're going? You need a map? Ladies invite your gentlemen friends to wash their hands and take a swig of that mouthwash that should always be readily available in your bathroom. Maybe you can help him kick this habit by starting up a little conversation about how you little you think of men who spit in public. You will know if he's guilty by his posture - send him back to the bathroom. This hasn't been a very pleasant topic for us today. We love this country and there's no reason why we all can't make it a better place to rest our soles on. A friend of ours, upon meeting our brother, asked, "Do you have the same father?" She was directing her question and finger to our brother. Jerry is lighter skinned than Yvette and me. His skin color is closer to our mother's. We're brown skin like our father. Jerry's hair is also different. He and our father have what used to be referred to as 'good hair' - hair that doesn't need straightening, more like white people's hair. Jerry would have a difficult time growing dreadlocks. Yvette and I have hair that gave us perfect Afros until we decided to start straightening out the kinks. None of this is unique in a black family. Some of us are dark, some light and some, somewhere in between. Basic knowledge of African American history could explain the array of complexions one black family can have. All three of us looked at our curious and severely ignorant friend as if she had three heads. I remember feeling hurt and angry. I felt as though she was trying to break up our family with something dark and unknown. She was a smart girl, quick witted and lots of fun. But not anymore, at least not to me. To me she'd morphed into the kind of person my mother would say, "Hasn't been anywhere, doesn't know better." Our father taught me a lesson about personal questions. He overheard me asking one of our playmates, "Where's your mother?" I'd never seen her and since we all had mothers, I wanted to know where his was, I had assumed he had one. "Don't ever ask people questions like that," he told me after I was whisked away to another room. He wasn't angry but he was firm. "Maybe he doesn't know where is mother is or maybe it could hurt him," my father explained. Don't worry about Yvette and me trying to dig into your family's business. You'll let us know what you want us to know. The question our friend asked was about more than skin color. Having always lived in poorer neighborhoods, she was subscribing to what she had seen, children in one family fathered by more than one man. Whereas blacks tend to ask about who's father belongs to whom, whites are more interested in the nuptial piece of the equation. "Were your parents married?" a friend asked. I asked her to be honest and tell me if she would have asked me that question if I were white. She turned red. Another white friend was trying understand how many fathered the six of us (three). "That's a lot," he marveled. "Not as many different fathers Elizabeth Taylor's kids have," I snapped back. The burning question he never asked was, "Was your mother married to any of them." We have been asked this question too. If you're not sure of a question, look in the mirror and ask yourself first. It's okay if you look stupid, it'll lead you to a better question or maybe a piece of good conversation. It's best to stay away from those questions about families. The answer probably isn't going to improve the quality of your life and it'll only make you look uncouth. Do you have a personal question that irks you? Let us know. Or is it too personal? When Yvonne lived in Italy, one day she ordered in lunch. She shared an office with three other people. There was a lot of work to do and she thought she was being efficient. The Italians thought the whole thing stunk! "They told me that my toasted sandwich was stinking up the office and making it smell like meal time in a hospital." I felt their pain or at least I smelled it when one of my colleagues brought in a 'nice' piece of fish (Why is fish always nice?) that was leftover from her dinner. She popped it into the microwave and had the office smelling like a seafood shack. The scent lingered like cheap perfume for the rest of the afternoon, at the end of the day it wasn't nice at all. We don't have anything against seafood but eating it in a limited space with poor air circulation is disrespectful, it shows lack of regard for your fellow workers. 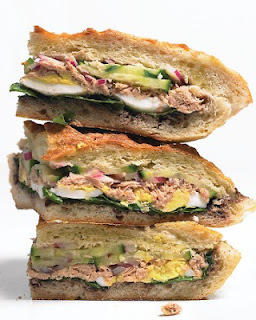 Don't reach for the tuna fish sandwich, don't even think about the salami hero and watch out for egg salad. A bag of chips is all right but peanuts and corn chips are best eaten when when you're in your own home. How you eat in your own space at work is one thing but if it' a working lunch with other people, watch your mouth. Who created the working lunch? Was it a ploy to get a free sandwich on the company's dime? No way can it be time efficient because you have to sit there and wait for people to bite and chew. Of course there are always those who can't wait to make their point. This is never worthwhile because they usually have to repeat what they've said. It's hard to speak clearly about projected earnings with a mouthful of a mysterious lunch meats. Turkey sandwiches don't offend and ham and cheese is all right depending on the cheese. Roast Beef won't cloud the air and neither will grilled vegetables. Stay away from those steam tables with meats and vegetables playing hide and seek in sauces and gravies. Lunch makes sense. It's good for you and we can all use a break. But the next time you have lunch at the desk, give the rest of the office a break. We always find it odd when people who like to say grace can be so graceless about it. Some have a way of making you feel like a heathen when you go straight for the food and not the blessing. "Exuuse me," we have to say grace first!" demands one friend with honorable intentions but a lousy way of delivering them. Grace is a good thing. It's nice when people join hands, unite and give thanks for what they're about to eat - Lord knows these days we better give as much thanks as possible for whatever blessings we have. Growing up Yvette and I weren't required to say grace but we were thankful for whatever food made its way to our table. However, when we were guests in another home we always knew better than than to dive into our food. We took our cue from our hosts as we should all do. We didn't have a healthy stock of blessings in our repertoire so rather than trying bless along we were quiet and at the end would join in with a heartfelt, "Amen." "Yvonne, we say grace at our table. Is that all right?" A friend asked when I was visiting her family in Kentucky. It was the first time I'd seen my friend and her husband since they'd had children. I thought is was thoughtful of her to ask the question. It wasn't a demand, it wasn't aggressive and I felt privileged in that I was being asked to be included in their ritual. "Yes, of course," I said. We joined hands, my friend's husband blessed the table with something lovely and brief. Lunch was great, my friends were gracious and their kids were charming. It was truly a blessing and they made me feel as though I had graced their table. The Shoeless Household: Outfit Spoiler Or Floor Saver? A friend of ours has a new seat in his apartment. He keeps it by the door so that you'll have a place to sit while you take off your shoes. He's not doing it for religious reasons, he's asking guests to mess up their outfits or snag their stockings because he wants to keep his beautiful wood floors beautiful. He doesn't provide slippers but he wears slippers and he doesn't have any rugs. What's a well dressed guest to do? You could travel with your own slippers, or the 'savior of floors' host could buy the same paper slippers nail salons provide their customers with after a pedicures. Since he's a guy he probably doesn't understand that wood and stockings don't mix and this can become a pricey practice for him. We think that in the event of snags, he should pay for a new pantyhose. What about the rest of the outfit? Who wants their pants sweeping the floor because the perfect length just became a little too long without the heel height? We see the possibility of other people's dry cleaning bills in his future. What happened to making guests comfortable? When you invite people into your home they should spend their time comfortably. Also, some people have really ugly feet and maybe they don't want others to see them. This could also be a deal breaker for two people meeting for the first time. And do we as guests have the right to ask when was the last time his floor was cleaned? Something about a roomful of people padding around with no shoes is odd, it's as if everyone just got a little too familiar too soon. We think our friend should re-think this issue because it is racked with issues. Years ago plastic covers were used to protect furniture. In the winter the plastic was cold, the cheap stuff would start to crack. In the summer you would try and get up and take the plastic covered cushion with you. It was a mess and so is asking people to take their shoes off. A friend just spent a few dreadful days with close family members who spent a few days giving undivided attention to their Blackberrys and very little to their host. First it was call waiting. You call someone just for a friendly chat, you're in the middle of a story and the next thing you don't rate. There's another call and it's more important than your call, it can't wait even though the service that enabled it is called Call Waiting. Now we've gone high rude-tech. You're talking to someone and they're not looking at you but kind of keep a raised eyebrow to imply that they hear you. They don't see you because they're heads are down, as if they're nodding off as they fire off emails and check for more. If one is waiting for some important life-altering message, they should leave the room politely, as if they have to make pressing call. If you're paying someone a visit, turning off the Blackberry is a good idea and maybe quickly check messages when you feign natura vocat (nature calling). When did we all become so important? The fact is is that we're not all so important. Many Blackberry users are not running companies or making record making deals. But somehow that device makes them feel that they're on the fast track to something - an Evite? Our social graces have already started to fade to Blackberry. When a Blackberry user responds to an email there's a little line that lets you know that it was sent from their Blackberry. This is supposed to let you know that they are on the case about that Dalai Lama quiz they wanted to share with you. Or maybe they want to show how special you are and even though they're busy doing twenty things there was time for them to ignore someone else as they dropped their heads to respond to you. If you find yourself in the situation of our friend, say something. Tell them that you were looking forward to spending time with them but it's really hard when they're constantly on their Blackberrys. Plan activities so that they won't have time or the interest in reaching out to others. You can offer them something that will involve both hands - a cup of hot chocolate, a sandwich or maybe corn on the cob dripping with butter. You can serve Blueberries in a cup. Bluberries are better for everybody. They're good anti-oxidants that'll protect you from those free radicals flying all over the place. After several spoonfuls maybe the Blackberry user, now healthier and maybe glowing, will want to give you some quality face time. Yvette and I proclaim today, Turn Off Your Gaydar Day. Let's try for one day to not wonder who is gay and who is not. Let's consider all the other things there are to consider about our fellow man or woman. Speculating on a person's sexuality is tired and tacky and more of us do it than not. It's become a national parlor game and not just among straights. It can be mean spirited and hurtful. Yvette thinks it's creepy. "When people spend their time talking about a person's sexuality, something so personal, to me they become the freaks they think gays are." This kind of conversation does nothing to improve the quality of one's life. It shows people who you are - maybe we like gossip to a certain extent but who wants to be around a gossip? Men are marrying men, women are marrying women openly and happily. So what's the big deal? Try and be more interesting today. Dig in and let your humanity out of the closet. We think that the only time it is important to discuss someone's sexuality is if, for example, a girlfriend has a serious crush on a guy and you know for a fact that he is gay, then and only then do we believe you have something to say. But you better know what you're talking about. The conversation cuts both ways. Maybe you have a friend who is gay or lesbian and she or he is interested in someone they're convinced is the same. If you know better, you need to tell your friend. Today, let's stay out of other people's business and bedrooms. Let's be different. When Dorothy Parker lost her husband, Alan Campbell, a woman asked her if there was anything she could do. "Why don't you get me a new husband?" Parker responded. Obviously there was some back story here. But the point is, according to an article Yvette read written by a woman who'd recently lost her husband, a grieving person oftentimes doesn't have a clue as to what they need so soon. A heartfelt note is perfect. Food is love, show up with a cake, a chicken (broiled or fried) or send a fruit basket. Sometimes a check is in order when you know for sure that the family is low on cash. Yvette and I have shown up with our cell phones, ready to make those calls no one wants to receive. Do something kind, do something sensitive. If you don't know what to say, let Hallmark say it for you. When we lost our cousin last year, I received my first sympathy card. I was touched because it showed recognition of mine and our family's loss. Yet, some family members didn't call our aunt because they didn't know what to say! What to do doesn't seem to be the problem for most people. It's what to say that gets tricky and sometimes can seem insensitive. A friend or ours lost her one hundred year old mother. Well meaning callers seemed to write off the death. "One hundred, she lived a full life, it was time." Or if someone died after a long illness some will say, "At least he won't be suffering anymore. Just think, he's not in pain." Maybe it's best to leave it up to the one who's grieving to put their loss into their own perspective. And please, enough with, "I bet he's up in heaven having a ball with friends." That may be but here on earth there's a family grieving. Don't play reporter when there's been a fatal accident. Yvette remembers a person grilling someone who'd just lost their loved one in an accident. "They wanted to know everything." If there is anytime for us to mind our business it's during times of mourning. We all want to know the facts but don't call up the wife, the husband or the parent. If you want to satisfy your curiosity, and that's understandable, call someone who's not so close. Sometimes when people die suddenly we want to find a reason that is some way will explain their death and maybe make us feel a little better. When Tim Russert died everyone wanted to know if he knew his condition. They wanted to know if he had had an inkling or warning. If so, we could understand and accept his untimely death. That may leave us feeling better but what about his wife and son? If you have bad news try not to leave it on an answer machine, nothing worse than bad news after the beep. Emails can be equally as devastating but there's probably no better way to reach a lot of people quickly. Yvette and I suggest phone calls, organize a posse of callers and tell them to keep phoning until a human answers the phone. No need to call in the middle of the night or dawn. This isn't about hot news off the press. There's no norm to grieving of offering condolences. There are a few dos and don't but at the end of the day, like a friend always says, "Do what you do." That's what Dorothy Parker did. A potluck dinner sounds like a good idea. It's simple enough, just ask everyone to bring a dish or maybe a bottle of wine. Potluck can turn into bad luck without some controls and limits. I have learned the hard way that just because you like someone doesn't mean you like what they have to bring to the table. And some contributions beg the question, "What is THAT?" When organizing a potluck dinner exercise the right of controlled chaos otherwise the table is going to look like a local food festival. Ask someone who you know for sure is a good cook to bring a main dish, a meat or a vegetable and I'm not talking about a String Bean Casserole, after an hour it looks like Casserole a la Mush. Don't ask a friend of a friend to bring anything to eat because no one may be able to vouch for their skills or the way they run their kitchen or their chicken. Did they wash it well? Did they wash it at all? On second thought maybe you should cook the main dishes and let others bring important sides. Ask for one fruit salad, a cake or a pie and ice cream. Consider food allergies, let guests know what's on the table and if need be, point out what a particular dish is or isn't made with - no nuts, for example. Use your own bowls and serving platters, get rid of the foil pans , you don't want your guests eating out of vats. If you don't like potluck dinners don't accept the invitation or say that you'll stop by for dessert or drink and offer to bring something. No need to point out your germ phobia or that you happen to know that one of the guests keeps a less than pristine kitchen. I don't think Yvette or I have ever thrown a potluck dinner. Even though most of it is outsourced, it's still a lot of work and risks are great. We like to cook and turn into control freaks in our kitchens. Food is love. It brings people together, it's an opportunity to show friends and family how much you care, how you want them to enjoy the best you have to offer. There's nothing wrong with the concept of potluck but in this world of killer tomatoes and spinach, maybe it's time to fine tune it. Maybe it's time to not push your luck, at least not at dinnertime. In this day of precious and pricey cell phone minutes, it's time to revisit what to say on your answering machine or voicemail service. First of all, what is the purpose of reciting for callers the number that they have just called? We don't know in the history of answering machines or voicemail if anyone has ever dialed a number, heard the number and said, "Oops, that doesn't sound like the number I wanted. Let me go back and check it." What's wrong with a pleasant "Hello"? What about stating your name? As for saying that you're sorry you can't take the call - are you really that sorry with so much to be really sorry about? Don't be sorry, be brief. Blessings are thoughtful but they seem so personal and when you hear the same blessing again and again it kind of loses its blessedness. Yvette has an answering machine. I have voicemail. Nothing is more annoying when someone calls and assumes that I can hear them. “Hello, hello, are you there?” What are they thinking? I’m standing their making faces? And a word to parents who think it's really cute to let their children record a message - this is very annoying. And it is time consuming especially when the little one has a limited vocabulary and substitutes words with cooing. Why let two legged, phone calling vermin perverts know that small children are in the house? Buy your child a toy telephone and play telephone with him or her. This could be a great way to teach them telephone etiquette. Let us know if you got our message. We read somewhere that the comedian Eddie Murphy doesn't like shaking hands. We don't know if this is a fact but we don't blame him. Yvette said the other day she was on a train and engaged in some people watching. She noticed a young man reading a book, nothing special there but what he was doing with his right hand was kind of special. He was caressing the heal of his foot (he was wearing flip flops). He seemed fascinated with roughness of its skin that was very evident. Not only was it rough but it was dirty, too. She wondered if he extended that hand in a warm hand shake at one point during the remainder of his day. Probably. Do you extend your hand when you know that you've coughed or sneezed into it? What do you do if someone extends their hand to you and you know that your handshake is going to be less than pristine? We don't suggest that you say, "I can't shake your hand, I just sneezed into it and it's gross." We don't think the guy on the train with the crusty feet should say anything at all either. All you can do is shake the other person's hand and convince yourself that they like you wash their hands every chance they get. Think of the presidential candidates - imagine the business Purell is doing with them alone! "You Americans think about things like that," a French friend said when we told her about the footman. "Don't worry he's not going to shake your hand, what do you care?" Maybe she's right. Maybe we are getting crazy about germs. But when you think about people going into hospitals and getting sicker than they were when they came in because of germs, let's get crazy. Let's do something nice for ourselves and others. Let's wash our hands and shake in good faith. It's okay if you like your grapes peeled. What you do with your own bunch of grapes is your own business. But what you do in the company of others with grapes on a tray of fruit or in a bowl, is something else. I learned the right way one evening at a friend's apartment in Milan. We were sitting at her table in the kitchen with wine and some fruit. As we were talking, I was plucking one grape after another off the bunch on in a bowl. When she couldn't stand it anymore, she said, "Yvonne, let me do something here." She took a pair of food scissors from a drawer and furiously cut away the vines I'd left bare and looking like a deer had been at the table. Then she cut the remaining grapes in small clusters so that instead of my grabbing a grape, I picked up four or five grapes in one neat bunch at a time - a much more elegant and sanitary way to eat vitis. When I serve grapes to guests, I do what I learned that evening in Milan. Not everyone I know was sitting at the table with me so if I'm close enough to the host, I'll ask where are the scissors and offer to help with the grapes. These days with germ phobia in full swing, I am usually thanked. If I'm not a close friend of the host, I say nothing and touch nothing - maybe a strawberry, if not, I'll take my grapes in a glass.